The Chicago Transit Authority is planning to fire the operator of a Blue Line train who reportedly admitted to being very tired before crashing into O'Hare airport station last week. 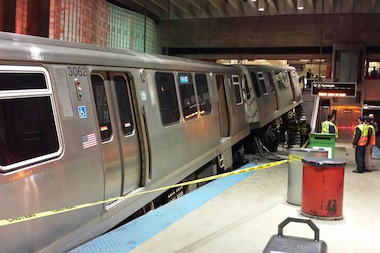 CHICAGO — The Chicago Transit Authority is planning to fire the operator of a Blue Line train who admitted to being very tired before crashing into the station at O'Hare airport last week. The operator is expected to get notice of the agency's plans to terminate her Friday because she was responsible for two safety violations, according to the CTA. In February, the operator had a similar incident when she dozed off and failed to stop a train in time at a station, resulting in at least one car missing the platform, according to CTA. Even without the previous violation, the nature of last week's incident would have led to the operator's firing, agency spokeswoman Tammy Chase said. News of plans to fire the train operator came the same day that the CTA announced changes to its train operators' work schedules. Robert Kelly, president of the Amalgamated Transit Union Local 308, told the Tribune the operator's hectic work schedule may have been a factor in the crash. She was a fill-in employee, known as an "extra board," meaning she called in around 4:30 p.m. each day to learn her shift, he told the paper. The CTA sent a copy of the driver's 55.7 hour schedule to DNAinfo Chicago, and said the employee "volunteered" for 13.5 of the more than 55 hours that she worked. She was also off 18-hours prior to the O'Hare incident, the CTA said. The CTA said it immediately began an internal analysis after the accident to determine where improvements could be made. Under the new rules, train operators can work no more than 12 hours in a 14-hour period, and will have to be given 10 hours off between shifts instead of the current eight hours off. All rail operations employees will get at least one day off in a seven-day period. Currently there are no limits on the number of days in a row an employee can work. New train operators in their first year driving trains will be limited to 32 hours at the controls each week. Currently there is no limit on the number of hours they can operate trains each week. Since the crash, the CTA has already implemented two other changes at the O'Hare Blue Line Station by lowering the speed limit of trains approaching the station from 25 mph to 15 mph and moving the devices created to stop speeding trains farther from the end of the platform.